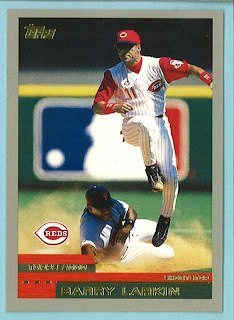 barry larkin's gig on the mlb network has me thinking about his hof candidacy. he is eligible in 2010. to me, he compares to alan trammell. a borderline case with a lot of people arguing from both sides. 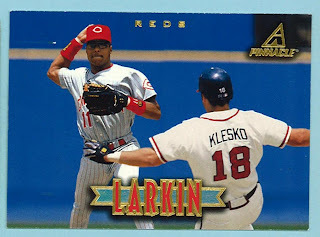 larkin had 2300+ hits, was a perennial all star, won an mvp and a world series, and was a leader on the field. i just don't know if its enough. heck, i don't know what the writers consider enough anymore. for me, though, i never went to a game to see him play. he wasn't a draw for me the way brett, schmidt, rose, maddux, pedro, piazza, etc. were. if it's any consolation, barry, i much prefer you to harold on tv, though. another in a series of trades that i have been delinquent in posting about. sorry about that. anyway, i sent scott at hand collated a bunch of 84 fleer and he in turn helped me out with my 2008 allen & ginter set, as well as my pursuit of the 2008 timeline timeless teams subset. brian bannister. it looks like he has me caught in a rundown. chris young. unless you're the a's, i am not a fan of shortened team names. d-backs. yanks. even mets. you're the metropolitans. deal with it. miguel cabrera. looks like miggy is going to the andruw jones school of conditioning. erik bedard. 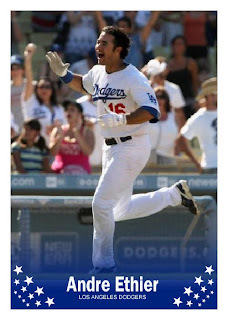 one of my 2007 fantasy team darlings, i am glad i passed on him in 2008.
mark teixiera. i don't understand these guys that run while holding their gloves. why not just wear them? some great cards for my various 2008 pursuits. thanks scott. frank howard was the national league rookie of the year for the dodgers in 1960. here he is on his 1965 topps card, although he played for the second generation washington senators that year. don't cry for frank, though. while he missed out on his second world series ring, he was able to play every day and put up some monstrous numbers during his time with the senators. he remains one of the most, if not the most, popular players in washington, and by all accounts is just an outstanding guy. i had heard at one time that he was a collector of cards and memorabilia, but i don't know if that is true or not. anyway, he had been working for the yankees the last few years, but now may be headed back to the nation's capital to try to help connect the nationals to the senators in the hearts and minds of the fans. and maybe show adam dunn how to really hit some bombs. sometimes when i look at cards like this 1970 tommie agee, i think i see dodger stadium. the color palette of the seats gives it away, but there's no pavilion in left field. it's actually shea stadium, before they orange-ified all the seats. with the demolition of shea complete, now is a good time to reflect on the 1966 american league rookie of the year. anyway, tommie agee will forever have a place in mets lore. in the 1969 world series, agee made two fantastic catches in game 3, most likely saving the game for the miracle mets. earlier that year, he hit the only upper deck home run in the stadium's history, a feat commemorated with a painted marker halfway up section 48. i believe the marker was saved for display at the mets' new stadium. tommie was traded by the mets to the astros after the 1972 season. he spent only a part of the 1973 season in houston before being traded to the cardinals. he didn't do too well in saint louis, and was traded to the dodgers after that season ended, as captured on his 1974 topps traded card. agee never played for the dodgers, though, as they released him in spring training, making his 1974 cards a true final tribute. agee died in 2001, but his memory will apparently live on in citi field, as well as the hearts of mets fans everywhere. here is a young don sutton on his burlap set card. i am happy to have seen him pitch several times in the late 70s, and then once in his final season. sutton, of course, is the holder of numerous dodger pitching records. wins, strikeouts, starts, innings pitched, games, etc. he linked the koufax/drysdale era to bobby welch before leaving for free agency and essentially being replaced in the rotation by fernando in 1981. what he didn't do was win a championship. he debuted with the dodgers in 1966. the year after they won the world series. still, don made it to 4 fall classics in his career, and missed 3 others to some degree. he almost always pitched well in the championship series, and was the primary pitching bright spot for the dodgers in their world series losses in 1974 and 1977. in 1978, however, the phillies roughed him up in the nlcs, and then the yankees really hammered him in the world series, scoring 10 runs in 12 innings against him. after the 1980 season in which he led the league in era, sutton signed with houston as a free agent, thus missing the dodgers' 1981 world championship team. in late 1982 he was traded by houston to the brewers, and he went 4-1 for milwaukee down the stretch, helping them win the al east. then, sutton won game 3 of the alcs against the angels, which started the brewers' comeback from a two games to none deficit to win the pennant. however, in the world series, the cardinals smacked him around pretty good. pitching for the angels in the 1986 alcs, sutton pitched well in his game 4 start and in relief in game 7, but the red sox prevailed. sutton later returned to the dodgers for a final season in 1988. seeing him pitch that year, it was obvious that he was in decline, but he was still getting people out, so his release in august of that season was kind of a surprise to me. and it didn't go over too well with him, as i recall. not that it should have - the team was in first place and he was don sutton for crying out loud. remember, this was still when the o'malleys owned the team and tommy lasorda was the manager. a player might have expected a little loyalty back then. i know it's not the only card of john smoltz in dodger stadium, but this is my favorite. and one of my favorite cards, period. the full bleed photo, the scoreboard, the yellow seats, the blue photographer's well, the sliver of green grass, the brown pitcher's mound. good times. usually, this angle is used for leftys, not rightys. but here, smoltz is throwing to first so we get the full frontal. so, i really like this card. it wouldn't be the same if he were in a red sox uni, though. future angels and (for one game) marlins manager cookie rojas turns it in the bottom of the 6th inning in front of a sparse crowd at yankee stadium on august 16, 1970. the scoreboard tells the tale (the royals lost 5-1) and number 9 (not roger maris) ron wood confirms it. thanks baseball reference! sidebar - there are many things i love about the 1971 set - the game photos, the black borders, the lowercase letters! nice set all around. back to cookie. he was acquired by the royals in june of 1970. it was the second time he had been traded in less than a year. the cardinals had acquired him from the phillies in late 1969 as part of the milestone curt flood trade. cookie had some good seasons with the royals, 1971 possibly being his best. here we find the hall of fame third baseman swinging for the fences in dodger stadium on a 1989 topps card. that's mike scioscia not catching the ball. 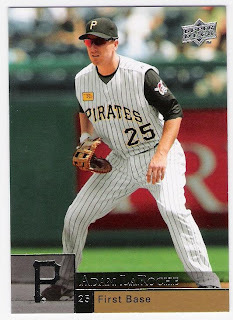 i like this card, even though that may not be a can of corn to left center. schmidt obviously had a powerful swing, and it is captured here in its glory. schmidt was in the news recently - quoted regarding the alex rodriguez show. i thought he was pretty honest and reasonable in his discourse. the thing i found most interesting is that he said he would "welcome" rodriguez if he were voted into the hall of fame. he didn't say he would support him. big difference. even more goose joak originals! andre ethier. 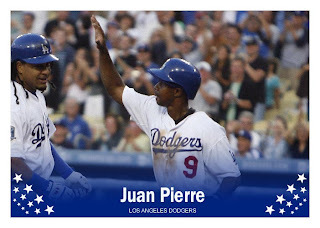 juan pierre. with manny lurking in the background. chin-lung hu. the man with the most 2008 cards (at least that's what it seemed like to me). hong-chih kuo. late round fantasy steal. not really. i am just far behind in posting about the 12 days giveaway i received from david. so, without further ado or fanfare, here is a sampling of the dodgers and twins that found their way. man, i had such high hopes for the outfield of davis, butler and strawberry. 2001 donruss adrian beltre. for a few years, we had a steady third baseman. those were the days. 2000 sp authentic kevin brown. meh. 1995 upper deck minors todd hollandsworth. the 1996 nl roy is shown here with an albuquerque duke acquaintance. now they're the isotopes and once again the dodgers affiliate. i am a big molitor fan. glad he came home to finish his career. 1996 bowman's best kirby puckett. looks like kirby was a believer in breathe-right strips. so was wayne gretzky and randy moss. i don't really think they did much, but whatever. 2008 topps allen & ginter national jackie robinson. this is a card from the special set produced by topps for the national sports card convention, depicting famous events at yankee stadium. this is, of course, jackie's famous steal of home against the yankees in the 1955 world series. you know, the one that yogi still claims was an out? great stuff, david. thank you! and merry christmas! though listed as an outfielder on his 1972 rookie card, ron cey never played a game beyond the infield in his major league career. in fact, he never played anywhere other than 3rd base until his final season. the penguin made his major league debut during the 1971 season, going 0 for 2 in 2 late season 9th inning pinch hitting appearances. he struck out both times. he wouldn't appear in the field until the 1972 season, when he would start 11 games while batting .270 with an ops of .778.
garvey, meanwhile, would build off his 1971 season which saw him play 81 games exclusively at 3rd base, to appear in 96 games in 1972, including his first 3 at first base. garvey's ops jumped 62 points in 1972 to .734. his fielding percentage took a nosedive, though - down to a whopping .902 as he led all national league third basemen in errors. thus, the impetus for the move to first. notice that, while garvey got rid of the black batting glove, bill russell did not. after essentially splitting his time between the outfield and second base in 1971, russell would spend the vast majority of 1972 (121 out of 127 games) at shortstop. the stability with his position may have contributed to improvements at the plate (if you believe in those types of performance cliches) as he hit .272 with an ops of .692, both big improvements over his 1971 numbers. he did make more errors than any other national league shortstop, however, joining garvey in that regard. i saw the benjamin button movie last week. not too bad, although a tad long for my tastes. i was thinking about age a lot afterwards, which brought me to good ol' satchel paige. estimated to have been born in 1906, satchel was 42 years young in 1948 when he debuted in the major leagues. as a "rookie", he went 6-1 for the indians with a 2.48 era. he joined the browns after being released by the indians and spending a year barnstorming, and promptly won 12 games for them in 1952. paige was released by the browns after the 1953 season, when he was around 47 years old. in 1965, charlie finley signed the approximately 59 year old paige to a one-game contract. paige started against the red sox and pitched 3 scoreless innings, allowing only one hit (to carl yastrzemski). after considering age and the career of mr. paige, i think i will 'jangle' more often. happy (belated) birthday to the penguin, ron cey. 61 years young yesterday, the 15th. and i feel a heck of a lot older myself. i wasn't born in time to witness gil hodges' playing career, or even his managerial career. however, through reading about baseball and the dodgers in particular, i have come to understand and appreciate his performance in a baseball uniform - from slugging first baseman for the dodgers and expansion mets to triumphant manager of the 1969 miracle mets. incidentally, i consider it a bit of a crime that his number is retired by the mets, but not the dodgers. 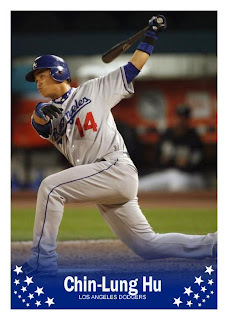 hopefully, gil will be inducted into the hall of fame and the dodgers will then be able to retire number 14 for good. ...we have bobby instead, on this special day. tommy lasorda's preference for manager of the dodgers may or may not have invented the 'wrap' sandwich. 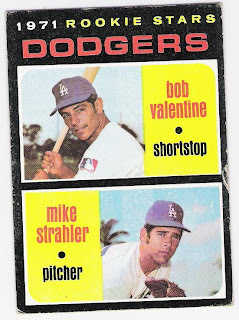 in the spirit of 2009 topps - let's play 6 degrees of bobby valentine: i am good friends with a guy who is married to a woman whose great uncle is ralph branca whose daughter is married to bobby valentine. small world, i know. like the colors of a rainbow, so too are the dodgers of brooklyn and los angeles. 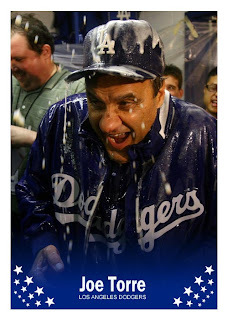 and if you notice - there's tommy lasorda on the card, too. no doubt bleeding dodger blue. is that a real american idol? sure, it's randy jackson. 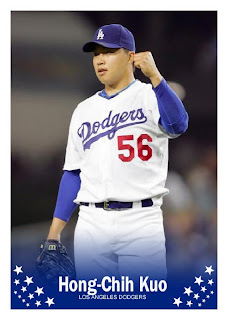 but if you squint and tilt the card (ok, your monitor or handheld), the dodger lurking in the background looks like it could be duke snider. duke, of course, was revered by the fans in brooklyn during his time there. he hit more home runs in the 1950's than anyone else, and was one of only 2 players to drive in over 1000 runs in that decade. the other was this guy. duke's career spanned the dodgers' brooklyn to los angeles move, and he eventually played for 3 of the 4 new york teams. only the yankees were denied his presence, although i am not sure if that would have been worse than seeing the duke of flatbush in a giants uniform. today, duke is the only surviving member of the 1955 world champion team that was on the field for the final out. it was fitting that he led the opening day ceremonies last year at dodger stadium by walking to centerfield in uniform, followed eventually by a host of former players. let's hope he is around for many more opening days. to most dodger fans, the mention of 'duke' will elicit thoughts of the silver fox, duke snider. but, there was another. prior to the 1971 season, the dodgers traded for cleveland catcher/first baseman/outfielder duke sims, creating the need for this fantastic 1971 o-pee-chee card. sidenote - how awesome would it be if upper deck had some of these cards in their 2009 o-pee-chee set? don't airbrush cc sabathia into the pinstripes, just use the yankees text and note that he signed as a free agent. ok - back to duke. sims would play one and a half seasons for the dodgers before going to detroit on a waiver claim. the dodgers used him exclusively as a catcher, alongside tom haller, joe ferguson and the immortal chris cannizzaro. sims would play for the yankees and texas before retiring prior to the 1975 season. bobby bonilla. he hit only .237 for the dodgers after joining them in the middle of the 1998 season. he was part of the piazza trade, so many dodger fans were already biased against him, but his performance in 72 games for the blue did nothing to win them/us over. his ops was only .665, and he made 12 errors in 124 chances at third base. thank goodness adrian beltre was ready in 1999.
here he is lurking behind ramon martinez, in no way ready for any action at third. after the 1998 season, the dodgers traded bonilla back to the mets (where he had an even worse season) for mel rojas. if it weren't for the fact that it was the piazza trade, i would have completely forgotten about bonilla's time in la. and i would have been just fine with that. this is the oldest dodger card i own. it's a 1951 topps red back gil hodges. hodges debuted in 1943, going 0 for 2 in a single game. he missed the rest of the 1943 season, along with the 1944 and 1945 seasons while serving in the military. in 1950, he hit four homers in a game. his 17 bases in that game (he also had a single) tied the major league record. he was quite a clouting first baseman, indeed! on this goose joak original i created, that is! actually, i haven't read the book, nor do i intend to, but i wish he had just kept things to himself. focus on getting the dodgers back to the world series for the first time since 88 and not bring any distractions into the mix. i am sure that plaschke will rehash the book for the rest of the season, and we will wonder whether joe is managing or just building material for his next book. at first glance, you might think that gil hodges was posing in front of some ancient ruins - perhaps standing in the middle of italy or greece. nope. it's just the los angeles memorial coliseum. the dodgers played in the coliseum after moving from brooklyn until dodger stadium opened in 1962.
the coliseum opened in 1923, and has hosted the 1959 world series, the olympics (twice), nfl championship and pro bowl games, an mlb all star game, nfl and usfl teams, ncaa football, professional soccer, and even a democratic national convention. it was also the site of the best u2 concert i have ever seen (disclaimer - i've only seen them 5 times). incidentally, i don't know who was responsible for the ridiculously tailored sleeves on gil's jersey. yikes. i think out of 4 packs, i can make a composite pack to compete with dayf. here goes. aw, let's just do half a composite pack. matt kemp. aka the bison. aka my baseball salvation. blake dewitt. please make me forget about jeff kent. juan pierre. as dayf might say - meh. jeff kent. meh meh. ken griffey jr. coupon insert thing. out of 4 packs, i think i got 4 of these. all the same. 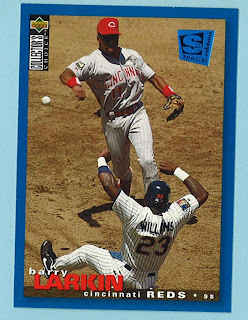 a colorful lastings milledge card. these next two were in the same pack and were in this order. barack and then maggie and ron. good times. adam laroche. study it. there will be a quiz. inkredible adam laroche auto. except i'm pretty sure it's andy. free andy laroche from his brother's shadow, fer cryin' out loud! this wouldn't have happened if they didn't use stickers. adam would have just given the cards to andy to sign, right? anyway, 4 nice packs. good way to start things off.